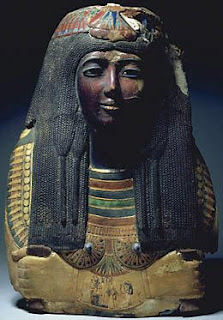 I have been reviewing some of the views on the Egyptian mummy mask acquired by the St Louis Art Museum. There is a useful piece in The International Lawyer (Spring 2013) --- based on the forfeiture statement --- that reminds us that the mummy mask was moved from Saqqara to Cairo in 1966 in box 54. And then in 1973 it was found that the mask was missing from box 54.
a. The mask is excavated at Saqqara in 1952.
b. Charly Mathez recalls (in 1997) that he had seen the mask in an antiquities dealer's shop in Brussels in 1952.
c. In 1962 the mask was purchased for the Kaloterna collection. d. The mask was acquired for the collection of Zuzi Jelinek who possessed it for "40 years" (sic.). e. Sometime between 1962 to 1966, the mask was returned to the archaeological store in Saqqara. f. In 1966 the mask was moved to Cairo in box 54.
g. In 1973 the mask was found to be missing from box 54.
h. The mask was back in the Jelinek collection. i. In 1997 the mask was sold to Phoenix Ancient Art. j. The mask was displayed in Geneva. k. In 1998 the mask was sold to SLAM. I have a strong hunch that this reconstruction is flawed. Perhaps the Director, Trustees and Curatorial Team of SLAM could explain how the timeline for the mummy mask can be presented. lawfully under then-applicable Egyptian law." It would be good to see that report. Who was the scholar? Is the person well known for searching collecting histories?